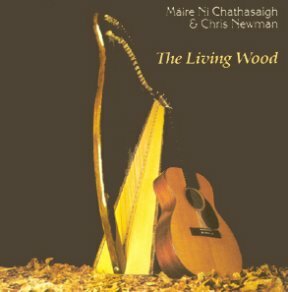 In 1988, Máire Ní Chathasaigh and Chris Newman released The Living Wood, their critically acclaimed first album together. It originally appeared on the American Green Linnet label, then on Black Crow. The licence reverted to Old Bridge Music in 1994 and we were delighted to be able to re-release it on Old Bridge Music. Bryan Ledgard redesigned the sleeve, and Chris digitally remixed it for optimal sound quality. N.B. : It's come to our attention that the Black Crow version of this album is still on sale in a few places. This contravenes the original licensing agreement and is illegal. We'd prefer that you did not buy this version - not least because of its inferior sound quality - and would be grateful if you could let us know if you see a copy on sale in a shop. The Scotsman "At their recent Edinburgh concert, Newman's finger-bustin' bluegrass wizardry made an exciting contrast with Máire's superbly-manicured traditional tones, and so it proves again in their joint album The Living Wood, where Newman contributes some invigorating American tunes to set alongside Máire's Irish themes...Máire's beautiful version of Fare Thee Well Lovely Mary is riveting, (but) Carolan's Lady Dillon, elegant and yet impassioned, is the high spot for me." Edinburgh Evening News "The Living Wood represents the coming together of two virtuoso performers...(Máire) is arguably the finest traditional harp player of her generation, whose revolutionary approach to her instrument has had a far-reaching and profound influence on the harp world...."
The Daily Telegraph "As uplifting a set of tunes as I have heard in years...Imaginatively arranged, this selection of tunes skips from polka to baroque, hornpipe to Basque waltz...a perfect showcase for the skill and panache which distinguish Máire's playing of the Irish harp, and the brilliant way Newman has with his 1929-built Martin guitar...the folk album of 1988." Broadbeat "A magical collection of tunes played with stunning virtuosity...The playing throughout is breathtaking. A real humdinger of an LP showcasing some superb acoustic music."